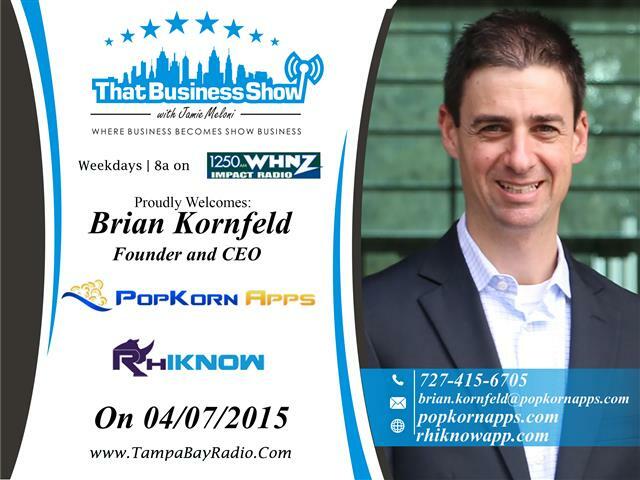 Brian Kornfeld joined me in studio today to talk about the app business and discuss his creation, Rhiknow, which is a social networking app that is designed to allow you to get company or referral suggestions from your friends or friends of friends. It’s sort of like Yelp but finely tuned so you only have input from people you know and trust. Brian launched this app 3 months ago and the response and interest has been great. The app is available on Android and IOS devices and you can learn more about the app by visiting http://www.rhiknowapp.com, and also available in the app store for downloading. Brian also put out a special promotion for new users that download the app today from listening to the show for a $25 gift card to the restaurant of their choice – just enter the recommended restaurant into the app when you sign up. You have a 1 in 10 chance of winning. Brian also speaks of Popkorn apps which is the parent company of Rhiknow apps whereby he assists other app developers in the design and launch of their ideas so please reach out to Brian for assistance if you are considering an app for your business or have just a great idea for an app! Brian can be reached at 727-415-6705 or email at brian.kornfeld@popkornapps.com and their site is http://www.popkornapps.com! 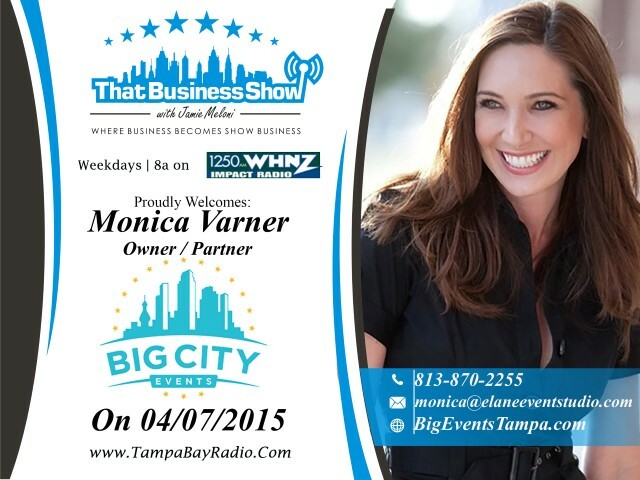 On the 2nd half of the show, I welcomed Monica Varner who is the owner of Big City Events, specializing in event planning. Monica has a paralegal background and made the journey to entrepreneurship a couple of years ago with this company and has planned a number of highly successful and entertaining events including the Gasparilla Film Festival and is now in charge of this year’s Guavaween, an event we speak of during the show and the change it has experience from drunken debauchery years ago to a much milder event in recent years. Monica spoke of some of the upcoming events in the area including the Downtown Carnival on May 2nd & 3rd and the Riverfest Beer Fun Run on May 3rd. Learn more about these events at http://www.bigeventstampa.com and reach out to her directly at 813-870-2255 or email at monica@elaneeventsstudio.com for more information!